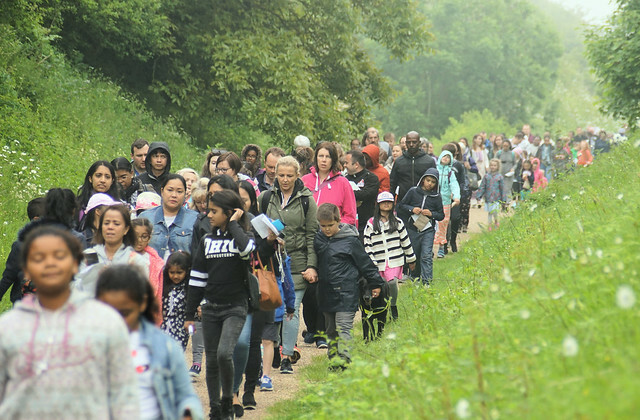 Over 400 young people and adults joined in an enthusiastic Children's Pilgrimage and Mass at Walsingham on Tuesday May 29, led by Bishop Alan Hopes. Large numbers of young pilgrims came from across the Diocese of East Anglia, including Cambridge, Huntingdon, Sawston, Beccles, Peterborough, Great Yarmouth, Gorleston, Thetford and Norwich. Everyone gathered in the Friday Market Place outside the Church of the Annunciation in Little Walsingham and then processed along the railway track path to the Catholic National Shrine, stopping for prayers, said by young people. Young pilgrims also received prayer cards, scripture verses and a rosary while on the way. Bishop Alan welcomed pilgrims to a Mass at the Chapel of Reconciliation. Ignite Youth Team chaplain Fr Luke Goymour gave the homily. He said: "We are on a journey of life, which has lots of twists and turns. It starts when we are born and finishes when we die and we meet God face to face. "God gives us special food for this journey ' the best food we could possibly imagine ' the Eucharist. Every time you come to Mass you witness a miracle. The priest takes bread and wine and something wonderful happens ' it becomes Jesus for us. The God who loves you comes to you in the form of bread and wine. "You are what you eat," said Fr Luke. "It is true on a natural level and on a spiritual level. When we come to the Eucharist we eat Jesus. Unless we eat his body and drink his blood and feed on his Word, then we cannot be Christ in the world. When we receive Jesus we become the presence of God." A vivid demonstration of this was made though loaves of bread spelling out the words Bread Of Life, baked overnight by Jo Graham from St John's Cathedral, which was incorporated into the Mass and then shared out with those picnicking in the shrine grounds afterwards. Reflecting on the day, pilgrimage organiser, Chris Storman, who has helped to organise it since the very first one 33 years ago, said: "It has been quite wonderful today. "The pilgrimage began when small groups from Thetford and Yarmouth met up at Walsingham and then other parishes said they would like to join in and it has grown from there. The numbers this year are one of the biggest I can remember. Explaining the purpose behind the pilgrimage, Chris said: "It is good to introduce young people to the idea of pilgrimage and to Walsingham itself. "It is a new experience for many of them, a new way of praying and there is a children-orientated Mass as well. They can also feel that they are part of a bigger family than just their own parish." To see a full picture gallery click here or see below.